When we think about the child and the exercises of care of the person, we have to take into consideration what it is that the child needs to accomplish to be able to care for himself. Here in the Toddler Environment we give him/her the necessary items to allow them to do it themselves. 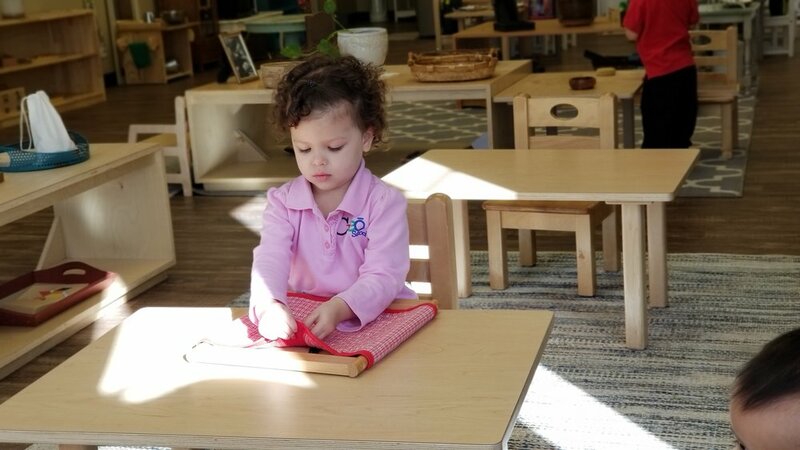 We set out towels to clean up after themselves, plates to serve themselves snack when available, Washing their hands at a sink low enough for each child to reach. How do you incorporate Care of the Person in your home? We have to consider that the child can do things for himself. He needs to be invited by the adult into active participation in his own care. The adult needs to prepare the environment in such a way that the child can be successful. At this stage, the child is very interested in his body and he is fascinated of all the activities that the adult has been doing for him like brushing their hair, washing them, changing their clothes; they can start doing these things. We must observe to see what the child is capable of. Setting up an area for your child at home is easier than one imagines. -A simple shelf in a low cabinet in the kitchen for them to take a plate out when dinner is ready. -A couple of towels within their reach for them to take one and clean up if there is a spill. We must acknowledge the growth of our children and acknowledge their full potential for future success! Button Frame is used to allow child to see his hand movements used to achieve buttoning. 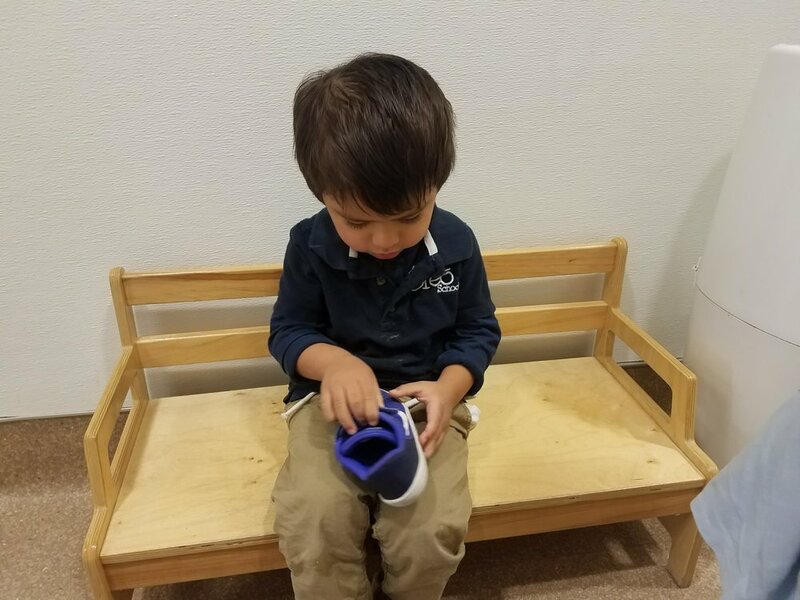 A small bench is accessible to the child to put on shoes by himself. 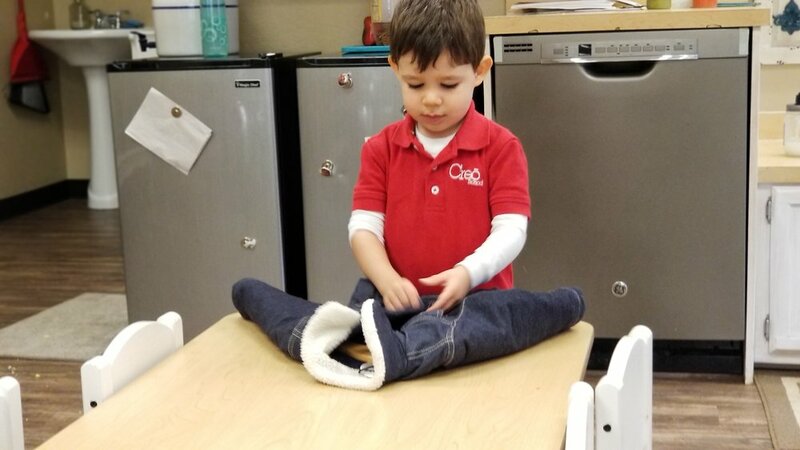 A hanger is placed inside his jacket on a table to allow child to use both hands to snap up his jacket. Hand washing at a table focuses on voluntary hand movement and aids in independence. The child has access to wash hands with soap & water and towels to dry hands.